COMMONWEALTH vs. JOHN F. SQUIRES, THIRD. COMMONWEALTH vs. STEVEN E. ANGIER. Possession of Burglarious Instruments. Death. Practice, Criminal, Death of party. At the trial of criminal complaints charging the defendants with possession of burglarious instruments, evidence of the defendants' suspicious conduct (i.e., walking on railroad tracks late at night in freezing weather and possessing a map not connected to any particular or nearby building, room, vault, safe, or other depository), without more, was not sufficient to prove an intent to use the tools in their possession (which were not by their nature burglarious) for burglarious purposes. [707-710] Gaziano, J., dissenting, with whom Botsford and Lowy, JJ., joined. COMPLAINTS received and sworn to in the Dedham Division of the District Court Department on February 4, 2013. The cases were tried before James H. McGuiness, Jr., J.
Kathleen J. Hill for Steven E. Angier. Carolyn L. Hely, Assistant District Attorney (Michael P.J. McGee, Assistant District Attorney, also present) for the Commonwealth. Patrick A. Michaud for John F. Squires, III. walking on a railroad track, G. L. c. 160, § 218, and possession of burglarious instruments, G. L. c. 266, § 49. [Note 3] The complaints arose from Norwood police officers' discovery of the defendants walking on the Massachusetts Bay Transportation Authority (MBTA) commuter rail train tracks near the Norwood central train station. After the officers searched the defendants and found tools, gloves, and two walkie-talkies tuned to the same channel, the defendants were arrested for walking on train tracks and possession of burglarious instruments. Squires moved for required findings of not guilty at the close of the Commonwealth's case, and both defendants so moved at the close of all evidence; the motions were denied. [Note 4] The judge sentenced each defendant to a term of imprisonment in a house of correction for two and one-half years and imposed on each defendant a fine of one hundred dollars. [Note 5] The defendants separately appealed, claiming, among other things, that the Commonwealth failed to present sufficient evidence to sustain the convictions of possession of burglarious implements. The Appeals Court affirmed in separate unpublished opinions, Commonwealth v. Squires, 89 Mass. App. Ct. 1102 (2016); Commonwealth v. Angier, 88 Mass. App. Ct. 1117 (2015). We allowed the defendants' applications for further appellate review. After the cases were entered in this court, but before oral argument, Angier's counsel filed a suggestion of death and moved to vacate his convictions. The Commonwealth opposed the motion, arguing that under Commonwealth v. De La Zerda, 416 Mass. 247 , 250-251 (1993), the order allowing Angier's application for further appellate review should be vacated. Because of the unique circumstances of this case, we address Angier's appeal on the merits and conclude that the Commonwealth failed to present sufficient evidence to sustain the convictions. Therefore, we reverse and vacate the convictions. Background. Taken in the light most favorable to the Commonwealth, Commonwealth v. Latimore, 378 Mass. 671 , 676-677 (1979), the jury could have found the following facts. On the evening of February 3, 2013, at or about 11 P.M., Norwood police Officer Derrick Wennerstrand, who was working as a plainclothes officer and driving an unmarked vehicle, was observing vehicle traffic in the area of a shopping plaza. The businesses located in the plaza were closed. He noticed a dark-colored sedan enter the parking lot and its two male occupants, the defendants, alight from the vehicle. Officer Wennerstrand radioed for backup as the defendants walked through an alley into a rear parking lot. Another officer arrived shortly thereafter, and the officers followed the footprints the defendants left in the fresh snow toward the MBTA commuter railroad tracks. The officers were able to follow the two sets of footprints through a small wooded area that led to the train tracks. As the officers approached the railroad tracks about five minutes later, they saw the defendants ahead, walking on the tracks heading south, away from the train station. Officer Wennerstrand noted that there were buildings on either side of the train tracks, but he did not observe the defendants veer off the tracks at any time. The defendants were approximately seventy-five yards away from the officers before they reversed their direction and headed back toward the officers. Officer Wennerstrand said, "Norwood police" and "Stop," but the defendants kept walking toward the officers, as if they were attempting to walk past the officers. Officer Wennerstrand again identified himself as Norwood police, holding up his arms, and ordered the defendants to stop; the defendants complied with the second order. Officer Wennerstrand first spoke with Squires, and then with Angier. Squires, who was wearing black work gloves, told Officer Wennerstrand that the men were "just out for a stroll." Officer Wennerstrand was suspicious; it was past 11 P.M. and the temperature was below freezing that night. Officer Wennerstrand searched Squires and found a walkie-talkie tuned to a particular channel in the pocket of Squires's jacket. Squires was placed in restraints and ordered to sit on the ground. black gloves, and a small red flashlight. A search of Angier's person revealed a second walkie-talkie, tuned to the same channel as the walkie-talkie found on Squires. Angier was also placed in restraints. The police subsequently searched Squires's vehicle and discovered a third set of black gloves and a small, yellow sledgehammer. The officers placed both defendants under arrest. The defendants were transported to the Norwood police station, where Officer Dillon Haldiman inventoried the items in the backpack and discovered what he described as a map. The map depicted an "L"-shaped space with the words "Going in" handwritten on the bottom next to an arrow pointing to markings that could represent an entrance. More arrows were drawn leading to an area marked with five "X" marks. After a jury trial, the defendants were convicted of walking on railroad tracks and possession of burglarious instruments. On further appellate review, the defendants argue that (1) the judge erroneously denied their motions for directed verdicts where the Commonwealth failed to present sufficient evidence that the defendants intended to use the tools in their possession to break into a particular "statutory place" to steal money or other property or to commit some other crime; (2) the judge erroneously instructed the jury on possession of burglarious instruments, which improperly lowered the burden of proof; and (3) the prosecutor engaged in improper vouching during the closing argument, which created a substantial risk of a miscarriage of justice. Discussion. 1. Effect of Angier's death on the order granting further appellate review. As a threshold matter, we first address the effect of Angier's death on the order granting his application for further appellate review. After we allowed the defendants' applications for further appellate review, but before oral argument occurred, Angier's counsel filed a suggestion of death for Angier. Subsequently, Angier's counsel filed a motion to vacate judgment and remand to the District Court to abate the prosecution, citing Commonwealth v. Latour, 397 Mass. 1007 (1986). The Commonwealth opposed the motion, citing De La Zerda, 416 Mass. at 251, for the proposition that when a defendant dies while his or her case is on collateral or further appellate review, the order allowing the defendant's application for further appellate review is vacated, leaving the judgment of the Appeals Court intact. However, because of the unique circumstances here, we depart from De La Zerda and address both defendants' arguments on the merits. In De La Zerda, 416 Mass. at 248, we noted that "[w]hen a defendant dies while his conviction is on direct review, it is our practice to vacate the judgment and remand the case with a direction to dismiss the complaint or indictment, thus abating the entire prosecution." However, when a defendant dies after an application for further appellate review has been granted, but not argued, the practice has been to vacate the order granting further appellate review, rather than abate the proceeding. Id. at 250-251. The United States Supreme Court employs a similar practice, vacating the order granting certiorari and dismissing the petition for certiorari. See, e.g., United States v. Mosely, 525 U.S. 120 (1998) (per curiam). Nevertheless, in De La Zerda, we noted that another important policy interest to consider was "the interests of justice," which require a different outcome here (citation omitted). See De La Zerda, supra at 251. Here, Angier and Squires were tried in a joint trial, but filed separate appeals in the Appeals Court. Despite their separate appeals, Squires, pursuant to Mass. R. App. P. 16 (j), 365 Mass. 860 (1974), incorporated by reference the arguments made by Angier, making no additional or different arguments of his own, and requested that his appeal be joined with Angier's. [Note 6] Squires, 89 Mass. App. Ct. 1102 . Similarly, Squires incorporated by reference Angier's arguments in his application for further appellate review, as well as in his brief to this court. As a result, Angier was the only defendant to present substantive appellate argument to this court, and thus we address Angier's arguments on the merits despite his death. Fairness dictates that Angier, even posthumously, should have the same outcome as Squires, especially where the defendants' legal arguments and factual circumstances are identical. In this narrow circumstance, it is in the interests of justice to depart from De La Zerda and address both defendants' appeals on the merits. from, or to commit some other crime in, such statutory place. We agree. "an engine, machine, tool or implement adapted and designed for cutting through, forcing or breaking open a building, room, vault, safe or other depository, in order to steal therefrom money or other property, or to commit any other crime, knowing the same to be adapted and designed for the purpose aforesaid, with intent to use or employ or allow the same to be used or employed for such purpose." G. L. c. 266, § 49.
the defendants' motions for direct verdicts were improperly denied where the Commonwealth failed to present evidence that the defendants intended to use ordinary tools found in their possession for unlawful purposes, even where there was evidence that the defendants were following and "casing" a United Parcel Service truck. [Note 7] Id. at 555, 561. The court noted that "because the evidence did not warrant a finding that the [suspected] hijacking was to be executed that day, the inference that those were the tools to be used in the hijacking is much attenuated." Id. at 561. Therefore, even where defendants are discovered with ordinary tools under suspicious circumstances, the Commonwealth must offer evidence establishing something more than mere suspicion -- proof beyond a reasonable doubt -- that the defendants intended to use the tools for burglarious purposes. Compare Jones, supra, and Commonwealth v. Porter, 70 Mass. App. Ct. 901 , 902 (2007) (burglarious intent where wire cutters were found in between storm door and front door of home and defendant was apprehended at scene of attempted burglary), with Dellinger, supra. Here, the Commonwealth argues that the defendants' burglarious intent was readily inferable from the location where the police found the defendants, the late hour at which the defendants were discovered, the below-freezing temperatures that night, and the possession of the map. We do not doubt that the discovery of the defendants on the railroad tracks late at night in freezing weather was suspicious conduct that warranted the threshold inquiry by the police. See Commonwealth v. Watson, 430 Mass. 725 , 729 (2000). But this suspicious conduct, without more, did not prove an intent to use the tools in their possession for a burglarious purpose. parked in a shopping plaza parking lot is no more probative of intent than their presence on the railroad tracks. The Commonwealth presented no evidence to prove that the defendants intended to use the ordinary tools in their possession to break into any such "place" as specified in § 49. It is insufficient to merely show possession of ordinary tools in proximity to a statutory place to establish burglarious intent. As to the map, the Commonwealth did not connect it to any particular or nearby building, room, vault, safe, or other depository, as contemplated by the statute. See G. L. c. 266, § 49. See also Commonwealth v. Hogan, 41 Mass. App. Ct. 73 , 74 (1996), quoting Black's Law Dictionary (6th ed. 1990) (defining "depository" as "[t]he place where a deposit is placed and kept . . . where something is deposited or stored as for safekeeping or convenience"). Although the map depicted an "L"-shaped space with the words "Going in" handwritten on it, there was no evidence that the defendants intended to use the map and the tools to break into a place named in § 49 with the intent to steal money or property therefrom or to commit some other crime. See Hogan, supra. To be sure, the Commonwealth does not have to present evidence of the exact statutorily named place that the defendants intended to "steal therefrom money or other property, or . . . commit any other crime," G. L. c. 266, § 49, but it must establish the defendants' intent to steal from such a place beyond a reasonable doubt. See Commonwealth v. Tivnon, 8 Gray 375 , 380 (1857). To infer intent from facts that establish nothing more than possession of the items found on the defendants would require a level of speculation that was properly rejected by the Appeals Court in Dellinger, 10 Mass. App. Ct. at 561. "[I]f, upon all the evidence, the question of guilt of the defendant[s] is left up to conjecture or surmise and has no solid foundation in established facts, a verdict of guilty cannot stand." Commonwealth v. Fancy, 349 Mass. 196 , 200 (1965), quoting Commonwealth v. O'Brien, 305 Mass. 393 , 401 (1940). instruments, the judgments are reversed, the verdicts are set aside, and judgments shall be entered for the defendants. GAZIANO, J. (dissenting, with whom Botsford and Lowy, JJ., join). These cases turn on the question whether the defendants possessed work tools with the intent to break into a building, in violation of G. L. c. 266, § 49. The court believes that the evidence, although suspicious enough to warrant a threshold inquiry, is insufficient to sustain a conviction for possession of burglarious instruments. In my view, the Commonwealth established the defendants' intent to use these tools to break into one of the buildings on either side of the railroad tracks. Accordingly, I dissent. The facts of the case, considered in the light most favorable to the Commonwealth, support a finding that the defendants intended to break into a nearby building on the night of their arrest. The police discovered the defendants, late at night, in the freezing cold, walking down railroad tracks that ran between two rows of commercial buildings. The defendants were in possession of a long "screwdriver/pry bar" and a crowbar, work tools suitable for breaking into a building. [Note Dissent-1] They also carried implements that could be utilized to aid in a burglary (a flashlight and work gloves), and walkie-talkie radios tuned to the same channel, presumably to alert one another of potential witnesses. One of the defendants offered the police officers the implausible explanation that they were "just out for a stroll." In most cases, evidence of an individual's intent is not ascertainable, but must be inferred from surrounding facts and circumstances. Commonwealth v. Lewis, 465 Mass. 119 , 125 (2013). The fact finder in this case did not have to look very far for evidence of the defendants' intent to break into a building. The police found a hand-drawn map in Angier's backpack. [Note Dissent-2] It depicts an "L"-shaped structure with multiple rooms, an arrow pointing to an entrance labeled "Going in," and multiple arrows leading to an area denoted by a series of "X" marks. The map also includes a set of parallel lines corresponding to the railroad tracks. veered off the railroad tracks, to the right or left, toward any of the commercial buildings. Second, the Commonwealth failed to connect the map to any "particular or nearby" building. I disagree. The crime of possession of burglarious instruments is "complete when the tools [are] procured with a design to use them for a burglarious purpose." Commonwealth v. Faust, 81 Mass. App. Ct. 498 , 500 (2012), quoting Commonwealth v. Tivnon, 8 Gray 375 , 380 (1857). Although an attempt to break into a particular building would be evidence of the defendants' state of mind, it is not necessary to sustain a conviction. See Commonwealth v. Rousseau, 61 Mass. App. Ct. 144 , 150-151 (2004) (evidence sufficient where defendants were found at 1 a.m. in closed State park that contained at least one building, while in possession of two screwdrivers, two sets of gloves, one ski mask, one radio, and one flashlight, although there was no evidence that defendants had attempted to break into any State park building). I also would hold, for the reasons stated above, that the hand-drawn map supports an inference that the defendants intended to break into a building. The court recognizes that the Commonwealth is not required to prove the precise place that the defendants intended to burglarize. 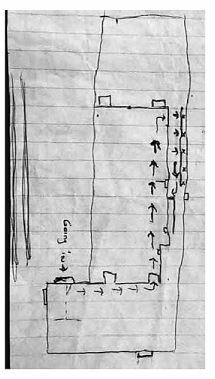 A commonsense view of the evidence, in accordance with the Latimore standard, leads to the conclusion that the crudely drawn map depicts a building, and the defendants intended to enter that structure at a certain location (i.e., the point marked "Going in") and to follow the path designated by the arrows to the "X" marks. See Commonwealth v. Latimore, 378 Mass. 671 , 676-677 (1979). Fact finders are not "required to divorce themselves of common sense, but rather should apply to facts which they find proven such reasonable inferences as are justified in light of their experience as to the natural inclinations of human beings." (citation omitted). Commonwealth v. Arias, 29 Mass. App. Ct. 613 , 618 (1990). [Note 2] The defendants' motions to sever on the day of trial were denied as untimely. [Note 3] The defendants do not challenge their convictions of walking on a railroad track. The Commonwealth dismissed one count of conspiracy for each defendant. [Note 4] Squires's docket includes entries denoting his counsel's oral motions for required findings of not guilty at both the close of the Commonwealth's case and at the close of all evidence. However, there are no such entries in Angier's docket. The transcript reflects an inaudible sidebar conference at the close of the Commonwealth's case and that, at the close of all evidence, Squires's counsel again moved for required findings of not guilty, while Angier's counsel also so moved. [Note 5] Angier's sentence was ordered to be served consecutively with the sentence he was currently serving in a house of correction. [Note 6] The appeals were docketed separately but referred to the same panel for decision. Commonwealth v. Squires, 89 Mass. App. Ct. 1102 (2016). [Note 7] Following the Appeals Court's decision in Commonwealth v. Dellinger, 10 Mass. App. Ct. 549 (1980), this court granted the parties' applications for further appellate review and decided the case on a different ground, expressly declining to address the issue of burglarious intent. See Commonwealth v. Dellinger, 383 Mass. 780 , 784 (1981). [Note Dissent-1] The defendants left a sledgehammer behind in the back seat of their vehicle. [Note Dissent-2] A copy of the map appears in the Appendix.